“There is increasing evidence that over time, untreated pain eventually rewrites the central nervous system, causing pathological changes to the brain and spinal cord, and that these in turn cause greater pain. I have a pain condition which I think is just a pipsqueak compared to your situation, but I could relate to that 1st paragraph because I think my posture was altered in a way that caused corollary pain in other areas. And Eeeek! on that last one — pain that actually damages your brain function?!?! So what are you saying? You want us to spread the word?? Haha. I already liked it on facebook. I plan to read it and do a review on my blog soon. I planned to do that even without the prizes. Got mine. Can’t wait to dive in. (Though Debbi’s comment about being excited to read about your pain is spot on. Sorry about that!). Not sure if it helped… but when your last book came out and also Shauna’s (dietgirl).. if I saw it at a bookstore, I took a few off the shelf and nudged it onto the main table up front in the new releases. Not sure if that is something you can promote..but I had fun doing it. I’m going to ask the store to order it just like you said! I got my copy today in the mail from Amazon.ca . I couldn’t wait for a signed copy and wasn’t even sure if us foeigners here in Canada were allowed to order them! So anyway, I have my copy and let the reading begin! :) You have a very entertaining writing style, so keep the books coming sistah, let next one be “How You Totally Got Rid of The Nasty Headache, for Good”!!!! I started reading it last evening. Am about 100 pages in. It is WONDERFULLY written. You have a knack for storytelling, Jennette. You should be VERY proud of yourself! I’m going to suggest it to a couple of my book group friends. Congratulations. Any New Books? is a free new book notification service subscribed by thousands of people, including some of the most influential folks in the book industry. It will most likely appear in other categories as well. Our newsletters go out, depending on the category, on Wednesday and Thursday. We aren’t participating in the contest (being editorially independent), but I thought you’d appreciate learning about this. Congratulations on publishing your second book! 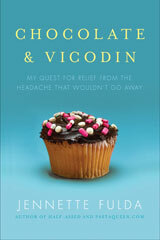 I just finished reading Chocolate & Vicodin and really enjoyed it, as I’m a fellow chronic invisible pain sufferer. (I have a genetic disease that causes me to have about 40 other conditions, ugh!) I’ve moaned about my own pain for 3+ years on my own blog, so I had to laugh when you wrote about posting a crazy blog entry in a moment of pain. Thankfully, I blog under an alias, so I feel no shame acting crazy half the time on my blog. It’s very liberating at times. After I had a hysterectomy, I woke up with a mofo of a headache that lasted 5 months straight. Since I was also a migraine sufferer in addition to this new sinus-type headache, I was near wits end & downing chocolate as much as I could, since my Relpax wasn’t helping it. Between that headache and my genetic disease, I’ve chased the dream of finding out what was wrong with me for years–so I can totally relate to what you went through. I’ll be reviewing your book on my own blog soon, and wanted to tell you thanks for writing about something so many people can relate to! @Antonio Cangiano – Thanks for letting me know about that, Antonio! I’m honored to be the staff pick, particularly considering how many memoirs and biographies came out this week. @The Girl from the Ghetto – I’m sorry to hear about your health problems, but I’m glad to hear you like the book. Thanks for planning to review it on your blog! 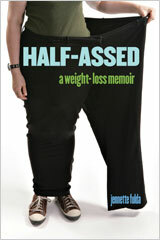 Send me the link when it’s up and I’ll add a link to the book site. I will vote for Chocolate as the more effective way for headache relief. I will search Amazon for your book and see which one worked better for you! Hi, Jennette. I gave you and your books a shout-out on my blog, “liked” you on Facebook, and posted another shout-out on my Facebook profile page. Being the big mouth that I am, I’ll also be flapping my lips endlessly at my family and friends until they all buy your books. :-) No prizes necessary, it was my pleasure.